Truth by Kbaig: “1965 Indo-Pak War” The Story of Defeat of 10 Times Bigger Power by the Pakistan!!! “1965 Indo-Pak War” The Story of Defeat of 10 Times Bigger Power by the Pakistan!!! One may remember that two months ago Indian army entered into the Azad Kashmir and abducted 4 Kashmiris farmers. On this terrorist activity of Indian army Azad Kashmir protested but Pakistani govt. 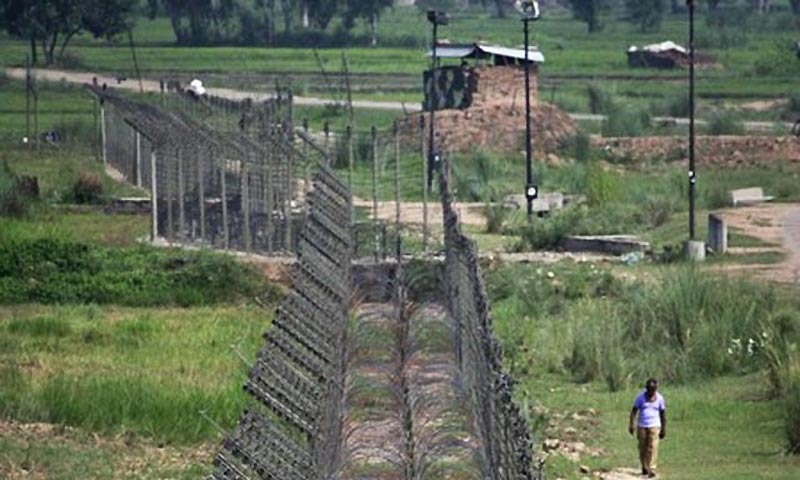 kept busy in begging for negotiations with Hindu India and Pakistani media also remained silent over this violation of LoC (Line of Control) by Hindu Army. 15 Km inside of LoC in the Indian Held Kashmir the Indian soldiers from 21 Bihar Regt that replaced Mahaar Battalion entered into the house of a Kashmiris family; as they were told by the leaving soldiers of Mahaar Battalion that there are young girls present in this house which were gang raped by these soldiers on the threat of murdering the whole family. This has been also reported to Kashmiris Freedom Fighters and they were waiting there for Indian soldiers. 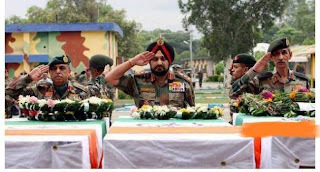 As soon as these soldiers from 21 Bihar Regiment reached in the house, the Kashmiris Mujahideen (freedom fighters) opened fire on the Indian soldiers in which 5 died on the spot while one managed to flee in the wounded condition and still kept in secret place by Indian govt. In this way Indian plan to use abducted Kashmiris farmers after staging any big terrorist attack, to initiate an attack over Azad Kashmir failed. 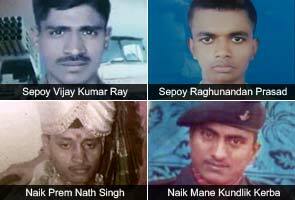 So India had no way left that she blames Pakistan army for death of these soldiers 15 Km inside of LoC in order to hide the real truth behind their death and suppress gang rapes of Kashmiri women being used as state policy to crush Kashmiri Freedom Movement because India is already facing problems due to increasing reports of rapes pushing New Delhi towards the status of CAPITAL of Rapes. 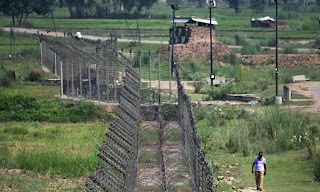 Those people who are aware of the structure of the fence fixed by Indian army over LoC know that this fence is inside of LoC where gates are fixed as well on 500 meters distance that are being used Kashmiris farmers by the will of the Indian army; from these gates farmers of Azad Kashmir were brought into Indian Held Kashmir those were later to be presented as Pakistani terrorists in order to create an excuse for attack over Azad Kashmir. For this purpose reports regarding heavy movement of Indian army and dumping of weapons near LoC were continuously being received. Keeping in view the war mania of Hindu India, All Parties Huriyat (Freedom) Conference from Srinagar, Indian Held Kashmir had warned Indian not to push the whole region towards fire of war but let Kashmiris decide their fate as they wish according to the resolutions of UNO. Although currently Indian plan has failed but this does not mean that India would give up her nature of war and conspiracies against Pakistan. Look at the history from 1947 to date each and every page is full of anti-Pakistan conspiracies, aggression and colored with the blood of Pakistanis. Many Indians involved in the bomb blasts and other terrorist activities present their terrorist activities as achievements in Indian newspapers while India is struggling to create an environment of war against Pakistan through propaganda in order to utilize it whenever she wants to invade Pakistan. Moreover whenever USA and other big powers are locked in some dispute or about to jump in war India starts threating Pakistan, especially in the month of September India suffers from the defeat in 1965. 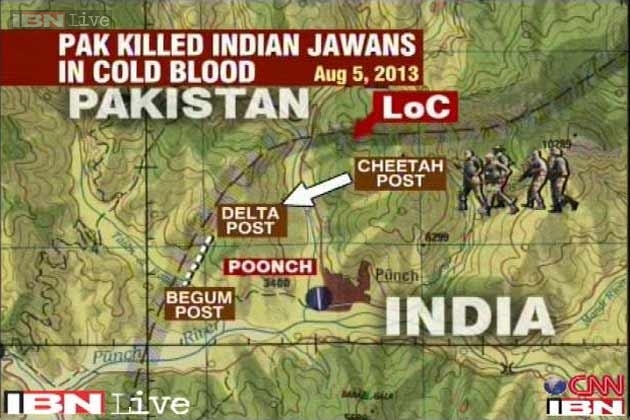 We are being told from the first day that India suddenly attacked Pakistan on 6 September 2013 but no one is ready to tell us the real plans behind the attack over Pakistan. 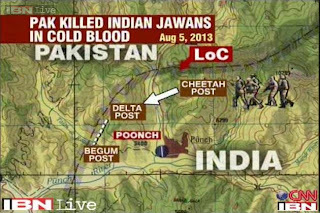 In this war soldiers and officers of Pakistan army not only stopped advance of invading Hindu army but also captured many Indian check-posts and border areas while chasing retreating Indian troops. After such a shameful retreat India has no way left but to bring ahead the Soviet Union and other world powers for cease fire. During this war the passion of nationalism and unity expressed by the nation was appreciable. Youngsters armed with sticks and steel rods arrived at the borders to crush Hindu soldiers who were later on returned back Pakistani soldiers that their passion is the actual power of the Pakistan army and Pakistan army is present their to face Indian army. Alas! Few sold-out minds and self-proclaimed scholars are busy in brain washing the younger generation that Pakistan army had never defeated Hindu India not even the war of 1965. They have no arguments to support their claims but just appreciation of Hindu India; they are identifiable as they belong to that traitor group of motherland who are continuously struggling to convert Pakistan into an atheist society devoid of moral and religious values as warranted by India. There were two goals behind the 1965 war imposed by India on Pakistan; 1) rapidly growing Pakistani economy that has attracted many other developing countries of Asia. South Korea and Singapore like countries wanted Pakistani to details of Pakistan’s 5 year development projects or plan. 2) to defeat Pakistan army in order to impose rulers that pleased India to force Pakistan accept Indian occupation of Indian Held Kashmir. Look at the history without any bias and ignoring the propaganda against Pakistan army going on since long ago you will realize that 1965 war devastated Pakistani economy before it reached its climax. Although this war came to an end but Pakistan never achieved its economy goals. Of course external forces were against the rapid development of new born Pakistan but bitter reality is that they had full support from within Pakistan. Alas! If we had identified and brought these traitors of nation as well as Ummah to justice timely; Pakistan would have been at the climax of economic development, like Mangla and Tarbela Dam, Kalabagh Dam would have been also completed and industrial and agricultural development would have become an example for the world to follow. The dirty game against Pakistan is wrapped up in so many curtains that in spite of being aware of the traitors, nation is still following them. If the war of 1965 have been successful as planned by India than the map of the subcontinent would have been much different but our brave soldiers left such examples of sacrifice by tying up dynamite to their chests and laying in front of Indian tanks that no one can find example of such heroic acts. 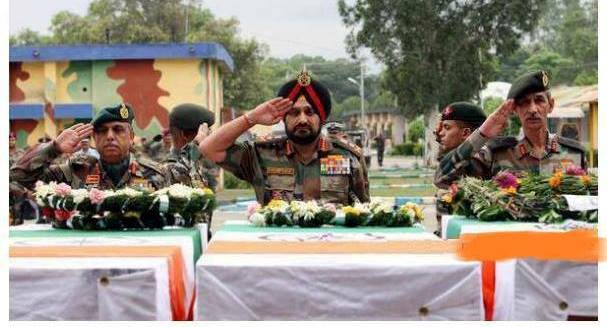 They defeated Indian aggression by converting their bodies into bombs and left a message to the whole world that if a soldier can kill for his country than he can also sacrifice his life for motherland as well. Although brave Pakistani soldiers defeated India clearly sabotaging a big conspiracy but India succeeded in achieving her damn goals in 1971 for which Pakistan army is blamed but why India 1965; no one dares to open up mouth. Just because of that some traitor of motherland have made deals with India and they never want an investigation to be carried out behind the reasons of Indian aggression as this will unveil their dirty face hidden behind the patriotism; but this makes me shiver to imagine that what would have been consequences if these traitors and India would have succeeded in her sinister plans? Pakistan would have been converted into colony of India forever just like as Nepal and Bhutan being ruled by pro-Indian rulers. The ceremony of laying down of weapons would have been staged in Lahore in spite of Platoon Ground of Dhaka. The freedom movement of Indian Held Kashmir left aside whole country would have been under the rule of pro-Indians. This inquiry could not be conducted because in order to hide the traitors such a propaganda has been done and Secrets of Tashkent has been mutilated in such a way that nation cannot understand the reality. Now it seems nation is being punished for defeating Hindu India in 1965 but this punishment is far more better than slavery to Hindu India from which nation was saved by the brave soldiers of Pakistan army at the cost of their lives and the fact is that this series of sacrifices by our soldiers had not came to an end yet; it is still going even after passage of 48 years and every soldier of our forces is filled with this passion to give up life to protect motherland. 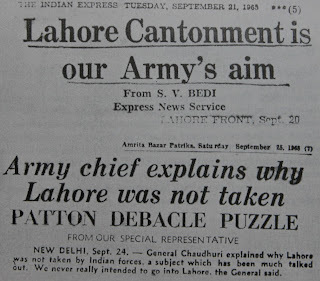 In the end I would like to include scanned copy of Indian Newspaper “The Indian Express” published at the end of 1965 war in which newspaper has questioned Indian Generals that what happened to those claims of celebrating victory at Gymkhana Lahore? 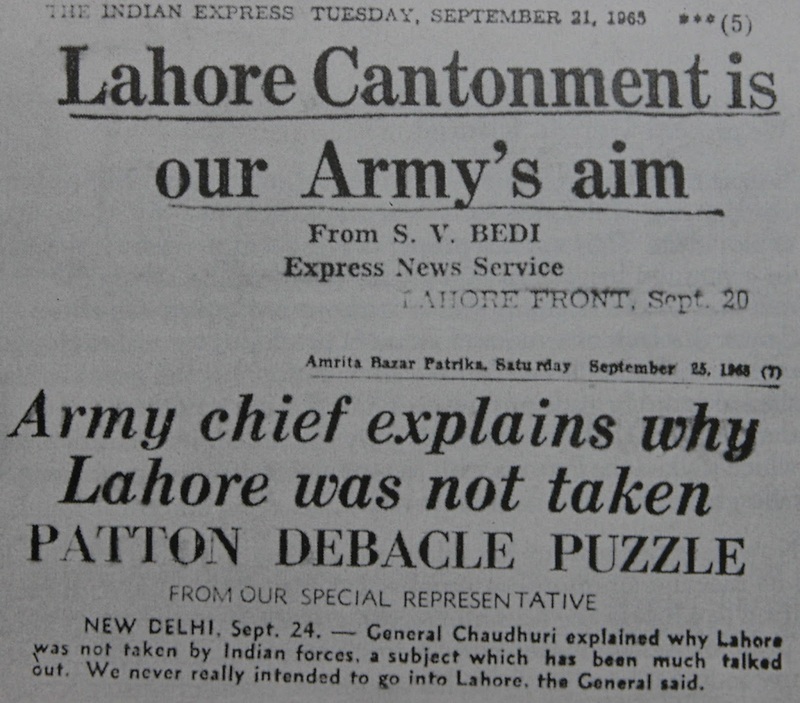 Indian Generals claimed to celebrate victory at Lahore?